Teaching your child proper oral care at a young age will help them to develop healthy routines that will create lifelong benefits. The best time to clean your child’s teeth is after breakfast and before bedtime. A good rule is to start flossing as soon as the child has teeth that are in contact with each other, usually around age two to three years. Not all children need to have their teeth flossed at this age, so ask your dentist for advice. But you can start a dental routine even before the teeth come in. It is recommended that, after a feeding, parents wipe a baby’s gums with a soft washcloth or a baby toothbrush using water only (no toothpaste). You can start brushing a child’s teeth around 12-24 months of age, using a child-size toothbrush and a pea-size amount of toothpaste. Another important consideration is when to start bringing your child to see a dentist. There are many benefits of bringing your child to see a Pediatric Dentist that is has been specifically trained to treat children’s developing teeth. At Austin Station Dental, we specialize in Pediatric Dentistry and know the unique problems that children face. We can keep an eye out for any potential problems such as cavities and gum problems. Not only do we understand juvenile teeth and development, we also recognise the anxiety behind a visit to the dentist. Our goal is to make sure your child’s experience is as easy and comfortable as possible. During the first visit, we focus on helping your child get used to the office and equipment in a way that is fun and child-friendly. The children’s corner in our reception area is filled with children’s books & DVDs. The overhead TVs in the office also act as a distraction to the children during restorative appointments. Call Austin Station Dental to book a check-up or if your child has a toothache. We offer recommendations for your child’s daily oral care and cleaning, plus cavity restoration for baby teeth or permanent teeth. Are you wondering about Bridges versus Implants in Coquitlam? If you have lost a tooth you may be wondering about bridges versus implants in Coquitlam and which is the best option for you. There are several factors that you should know which will help you to understand the differences between these options and what’s likely to work best for you. A Dental Bridge is a prosthesis that replaces one or more missing teeth. And, just like a land bridge, a dental bridge requires a solid structure on either side. In the case of your mouth, that solid structure is your adjacent teeth. So the surrounding teeth need to be in good shape. Dental bridges can last 10 to 15 years, or longer, with good oral hygiene and regular checkups. With a Dental Bridge, the adjacent teeth need to be prepped by removing most of the enamel in order to affix the bridge. It will usually require 2 or more visits to your dentist. On the first appointment, the surrounding teeth will be prepped and measurements taken for the bridge to be fabricated. On the second visit, if the teeth are in good shape, the dentist should be able to attach the bridge. There are other factors to determine how many visits it will take though. How long the tooth has been missing and the health of the gums make a difference. At one point, a bridge was your only choice for replacing missing teeth. But now there is another option: a Dental Implant (or tooth implant). Just as the name suggests, Dental Implants actually replace the missing tooth, or teeth, and the roots below. They are made to match your existing teeth and are stronger and more durable than bridges, often lasting a lifetime. The material the implants are made of actually fuse with your jawbone through a natural process called osseointegration and they are very resistant to decay and gum problems. There are advantages and disadvantages to both procedures and differences in cost. Some factors that guide your dentist’s decision are the health of the gums, how long the tooth or teeth have been missing, the state of the surrounding teeth and whether there are fillings, crowns or caps. Read more of our posts on Tips for Oral Health. Book an appointment to discuss your options with one of our experienced dentists today. Austin Station Dental is conveniently located in Austin Station in Coquitlam BC. There are many amenities to choose from in Austin Station and also FREE PARKING. Make your trip to the dentist fun or productive – combine it with grabbing a refreshment at Starbucks, doing your your grocery shopping at Save On Foods, picking up some wine or even dropping your children off for an art lesson at 4Cats studio. Our address is Suite 20-2662 Austin Ave and our patients come from many locations in and around Coquitlam such as Surrey, New Westminster, Port Coquitlam, Port Moody, Burnaby and Pit Meadows. We even have weekend and evening dentist appointments available. Our Coquitlam dental centre consists of a team of four dentists as well as friendly and capable office admin and dental support staff. Find us on Google Maps! Providing top quality dental services such as family dental care, pediatric dental care, and emergency dental care. Contact us today for an appointment. Coquitlam dentists Dr. Iqbal Kathrada, Dr. Dawn Jung-Doddington and Dr. Salima Shivji are the dentists at Austin Station Dental and are supported by a team of wonderful and experienced dental office staff. We welcome you to come and join our friendly and professional dental office. Our admin staff are very efficient and experienced and our dentists have a vast combined knowledge and skill set and are dedicated to providing the highest quality of dental care to each and every patient. We are located in Austin Station on the third floor above Thrifty Foods. There is free parking and lots of handy shops and restaurants at Austin Station – Suite 20-2662 Austin Ave. Coquitlam. Dr. Kathrada is the founder and principal dentist at Austin Station Dental (previously My Coquitlam Dentist). He completed a Bachelors of Science in Biochemistry with honours at the University of Victoria and completed his Doctor of Dental Medicine degree from UBC in 2004 and has been in full time practice since 2005 after completing several residencies. Dr. Kathrada is dedicated to keeping up with the latest in technology to ensure that his patients receive the highest quality dental care and most comfortable dental experience possible. We even use digital dental x-rays which are instant, provide much clearer and more detailed images; and transmit much lower doses of radiation! Dr. Dawn Jung-Doddington is a Vancouver born dentist who grew up in the Okanagan and received her Doctor of Medicine degree from UBC. Dr. Jung-Doddington has been practicing since 2001 and participates in many hours of continued education to keep up with the latest advancements in dentistry. Dr. Shivji graduated from a UK dental school in 1995 and then completed a second dental degree, with honours, in Canada. In 2001. Dr. Shivji has received awards for excellence in dentistry and very compassionate and patient with her patients, always taking time to talk, listen and explain. Directions – Dentist serving Surrey, Dentist serving Burnaby, Dentist serving New Westminster, Dentist serving Port Coquitlam, Dentist serving Maple Ridge, Dentist serving Pitt Meadows and Dentist serving Port Moody. If you are looking for a dentist accepting new patients in Coquitlam, please call or visit our Coquitlam dentists office to set up your appointment today! Austin Station Dental Clinic in Coquitlam BC now has 2 female dentists on the team! The team is made up of three dentists, Dr. Iqbal Kathrada, Dr. Salima Shivji and Dr. Charlotte Lee. Dr. Shivji graduated from a UK dental school in 1991 and then immigrated to Canada and completed a second dental degree with honours – wow! She even won awards in clinical restorative and pediatric dentistry. She is a very caring dentist, always listening and paying attention to patient needs and also is dedicated to keeping up with the latest in dental technology. Salima enjoys working with patients of all ages. She gives talks and demonstrations at preschools, helping even the youngest of patients form positive attitudes toward dentistry. 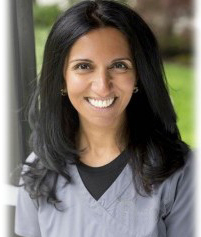 Meet Dr. Salima Shivji – a Female Dentist Coquitlam BC providing caring, top quality dental care for your whole family. With our well-rounded team of three highly trained, skilled and experienced dentists, including two female dentists, we really can serve pretty much any and all patients. We carry out aesthetic dentistry, family dentistry including babies and the generations all the way up and even emergency dentistry. We offer evening and weekend hours too! Couple all this with pleasant and efficient staff and state of the art technology and we really feel like we can meet the needs of most anyone and provide a positive experience and outcome, no matter what unique needs a patient may have. Contact us at Austin Station Dental (MyCoquitlamDentist.com) if you would like a female dentist in Coquitlam! What is a Digital Dental X-Ray? Digital dental x-ray equipment uses a sensor that is used either inside or outside the mouth to take the x-ray. The x-ray is then available immediately on the computer screen. This new technology replaces conventional x-ray equipment that produces x-rays on film. Why is a Dental Digital X-Ray Better? It’s digital! The x-rays can be easily stored on the computer and shared with other health professionals. You can see how this would be an improvement over old school film images. It’s instant! The sensor is positioned in the mouth, the x-ray taken and the x-ray instantly appears on the computer screen. From there the dental staff can proceed with diagnostics and patient education. Remarkable image quality – through the latest technology, digital xrays provide images that are extremely clear and detailed. Much better quality than film x-rays. Much lower radiation exposure for the client. There is lower radiation exposure to produce a digital image. Also, the precision and clarity of x-ray imaging often reduces the need for retakes, reducing exposure even further. ‘Greener’ technology in that there aren’t x-ray films being produced and chemicals being used to produce them. No more x-ray film in your mouth. An electronic sensor is used instead of x-ray film. Digital dental x-rays provide a more comfortable experience for the patient, are much faster to use than conventional x-rays, and expose the patient to much lower amounts of radiation. Dentists love them too for their ease of use in the office as well as ease of sharing with other health professionals. For more on digital dental x-rays in Coquitlam, contact our office at 604-931-6111.